The Western-themed town of Sisters is known as the Gateway to the Cascades and sits beneath a panorama of Cascade Mountains that provides a huge adventure playground for visitors and residents. Not be missed annual events are visits to the world renowned Sisters Quilt Show, Sisters Rodeo and Sisters Folk Festival. The nearby Deschutes National Forest offers 1.6 million acres of mountains, forests and wilderness areas featuring mile upon mile of trails, rivers, scenic drives and high mountain lakes. 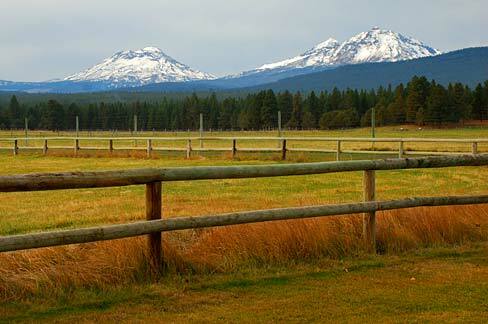 Visit Cold Springs Resort on the Metolius River which provides visitors with world class fly fishing, or hike the Three Sisters Wilderness Area, golf at the outstanding Black Butte Ranch and and Aspen Lakes, or explore the charming town of Sisters and its many speciality stores restaurants and art galleries. Suttle Lake, with its beautiful forest backdrop, has provide an enchanted escape for Oregonians and visitors for many generations. Lake Creek Lodge has a selection of beautiful historic cabins for rent, and for sale, just minutes from Sisters and the Metolius River. The Sisters area is also home to some of the best Mountain Biking trails in Oregon, including the Peterson Ridge and Suttle Lake trails. Hoodoo Ski Area is 20 miles west of town. More gentle activities include scenic drives through the Three Sisters Wilderness area and its lush alpine scenery, mountain lakes and abundant wildflower displays. Plan your visit to Sisters. Homes, condos and cabins for rent. Central Oregon golf resort community. 24 stand-alone craftsman style cabins. 21 cabins by the Metolius River. Resort in the heart of the Deschutes National Forest.